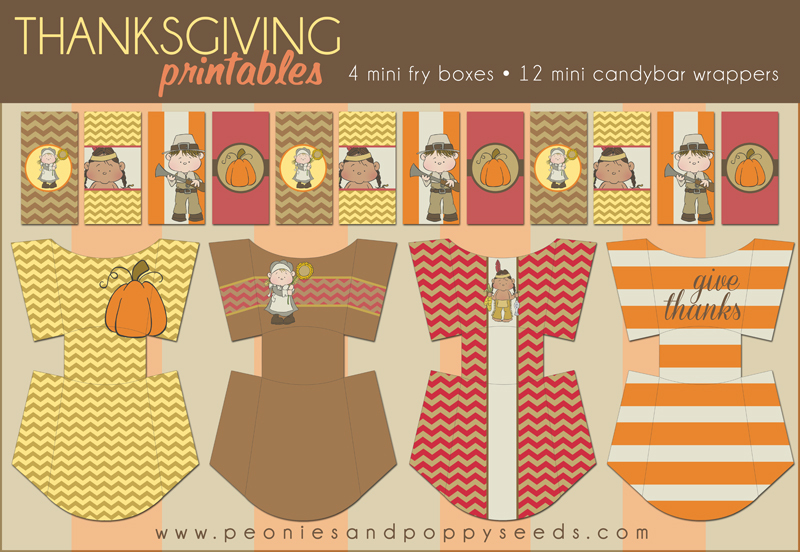 This next set of Thanksgiving printables are really going to help you make your treats and munchies look fab-o. Plus, they're super easy to use. Get these free Thanksgiving fryboxes and candybar wrappers by clicking on the picture, or just click here. The mini candybar wrappers are super fast, plus mini candybars can stave off any annoying relative who would otherwise be asking you if the turkey is finished every two minutes. The mini fryboxes are perfect for other munchies. Just put them together and fill them with cookies, nuts, gumdrops, candy corn, popcorn, or whatever. Then your guests can just grab their own box and much away. Check back later to get the last part of our Thanksgiving printables!